Words Done Write: Can losing business win new customers? Can losing business win new customers? You're in business to make money, right? If you sell products, you want them out of your store and into your customers' hands. Money in the hand keeps your bottom line happy, right? 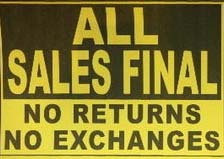 But, how do you handle things when your customer wants to return something? Do you strike an attitude because you don't want to return the cash or go through the inconvenience of a return? Or, do you seize the opportunity to win over the customer for life? This month, I was working on a project with a colleague and went to purchase some supplies. I bought eight, 10-count packages of DVD covers from Office Max (it was my first time there). Since we needed more than they had in stock, I ordered another 12 packs from the clerk. The project I was working on took a quick turn and no sooner than I received a call indicating that the remaining DVD covers arrived from the Office Max warehouse, my partner decided to skip the DVD sleeves altogether. Now, ordinarily I have no qualms about returning unused merchandise, but I felt bad that they had shipped 12 more units to the store at my request. And, now, I was flaking out and I didn't need them. I was genuinely sorry and went back to the store prepared for the clerk to be annoyed with me. After a minute with the cashier, he passed me off to someone else because his shift had ended. It was then that I had the pleasure of meeting Hernan, the store manager. I said, "I feel so bad that you guys went through the hassle of ordering these for me and shipping them here, and now I don't need them." Hernan's response? "Don't feel bad. Feel happy. It's a great day and we're all lucky to be alive." Wow. I was stunned. Although the two returns took longer than I expected, I didn't mind in the least. Hernan was a pleasure to talk with and he was the nicest retail associate that I've ever met. As he scanned my 20 packets, he said hello to a customer walking by and asked him how his vacation was. The customer smiled and responded. Hernan restored my faith in a lot of ways that day. There is still good customer service out there and, even in a big city like Los Angeles, there are folks who make a point to know their customers. From this point forward, I'm an Office Max fan and it's all due to Hernan. Think you can't gain a loyal customer by losing a sale? Think again. What a nice story that shows there's still humanity in the world! Thanks for sharing this as a silver lining to those times when we think we've lost out on an opportunity. Amber, aloha. What a wonderful story. Herman is a prime example of what great customer service is--being of service to the customer. Now there's a concept for you. Every once in a while people surprise you, huh? Thanks for stopping by, Erin! My favorite PR in Pink expert! Great story, Amber. So much of business is how you treat people. That pearl of wisdom seems to be rare these days but you definitely found a gem in Herman! Ok, what was Hernan smoking? We know about you left-coasters..:). I had a customer who tried to bring an insurance policy back; I locked the door and hid under the desk. True story; I got the renewal 'order' and the down payment from a customer to continue forward. When I got back to my office the customer called and asked if I had 'cashed' the check. He wanted his money back because he decided to go with someone else.....say what? Sumbich...........I didn't burn any bridges however, and got the account back the next year so how's that for customer service, huh? Yes, Hernan was a true gem! I want to shop there just so I can be sure he has job security! Yay, Herman! Love that story. I adore meeting people like Herman and really do try to do the same in my day to day wanderings around town. I think Herman's reaction had a lot to do with how you approached things, too. For a lot of folks out in the world, they give what they get. In this case, you gave a dose of goodness in your return approach; Herman reciprocated. Had you gone in and not been the least bit remorseful or apologetic, I still think Herman would have been a charmer! Yeah, I think you're right, Erica. Hernan would have been nice regardless. He just seemed to get that you attract more bees with honey than vinegar. A rare, but wonderful, trait! Great story Amber. A perfect example of how, with a little customer service 101, you will not only make the customer happy, you will make a "retail friend". Little did Hernan know that he was going to become "famous" for his act of excellent customer service. AND he certainly didn't know (or maybe he DID) that his outstanding customer service spoke for the brand that he represented and, as a result, you have shared a story that will likely encourage others to visit their local Office Max. Your experience also demonstrated that Hernan was not a flash in the pan...while you were there, he connected with a customer that Hernan had clearly taken the time to get to "know". Outstanding and a shining example of what all business owners should strive for! Claudia! Lovely to see you! You're so right. Hernan must be consistent in his actions. To inquire about a customer's vacation indicates a prolonged involvement with that client. Pretty amazing. We don't see that kind of thing here in LA! Thank YOU for adding to the discussion, my favorite dental professional! That is a wonderful story Amber. I so love to hear about good customer service, which really has got lost along the way somewhere. I always return to places with good service, usually it's those little corner stores which are a little more expensive, oh but the service is worth it. Good on Hernan, he could teach many people alot. Thank you Amber for sharing this story, I'm sure it will return a little faith in others as well, if they haven't found it, that they'll keep window shopping until they do. Hi Julie. You're so right. Usually it is the small corner store and not the chain that has the good customer service. But, I suppose it really is about the person doing the job, and not where the person works, huh? Thanks for adding to the dialogue here, Julie! Customer are one of priority of all customer service in any business.You will loose if you did not do that kind of regulation. While Herman did a great job, the way you handled it, Amber, needs to be mentioned, too. As a small biz owner, I can testify that things go much smoother when the customer starts out nice. Of course we work hard to make it right no matter what, but customer service agents are people, too. As a counselor who teaches anger management, I always have my clients rehearse how to approach a problem situation. Many want to do it right, but just don't have the skills. Thank you for the comment, Jeanie! And, the compliment! We're all just people and I do always try to treat others the way I'd like to be treated. Sometimes that works, sometimes it doesn't. Find out how THOUSAND of people like YOU are making a LIVING from home and are living their dreams TODAY. Can you be humble one day a year?